You need to deal with the snow piling up outside. It’s all over your driveway, sidewalks, and porch. A shovel is fine for a light dusting of snow that comes down only occasionally. But if you’re looking out at a winter wonderland, or expecting one soon – or even not until the next winter season, you’re probably in the market for a snow blower or thrower. If you’d rather not have to deal with mixing gas and oil or maintaining another large outdoor tool, and you don’t want to get tripped up by a long electrical cord, you should consider a cordless blower. These tools can take on the less-than-glamorous job of clearing snow, but they do it quieter and easier than ever. 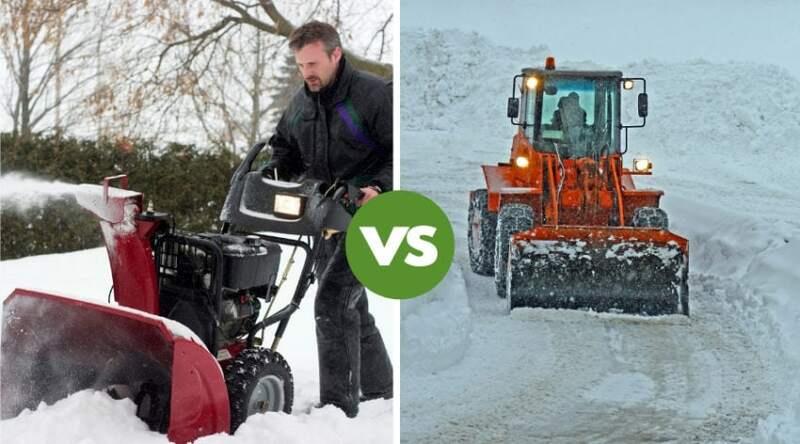 As with any tool like these, there are some pros and cons, which is why you should read our cordless snow blower reviews for more information about these machines. WHY BUY A CORDLESS SNOW BLOWER? Plowing capacity: 495 lbs. per min. Plowing capacity: 441 lbs. per min. Plowing capacity: 1000 lbs. per min. A cordless snow thrower or blower cuts the cord and removes any responsibility on your part to keep it full of engine oil and fuel. 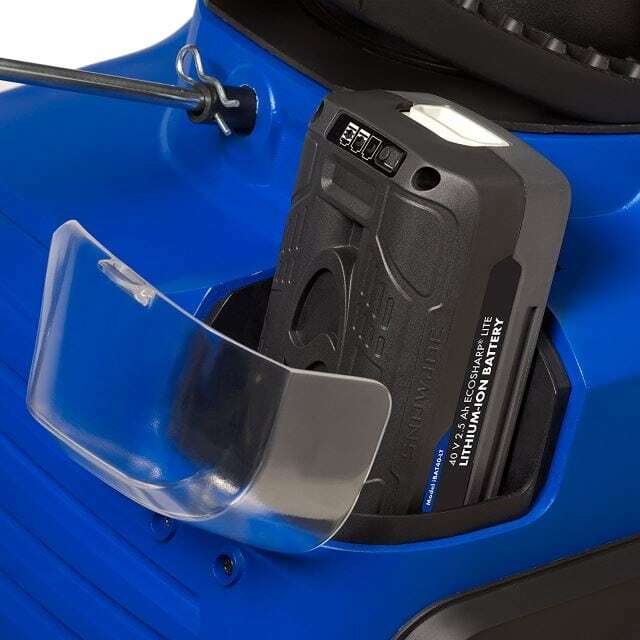 All you need to do is ensure your blocks of lithium-ion batteries are fully charged and ready to go when there’s a snowstorm coming. But even the best portable snow blower is still a hard sell for some homeowners. If you judge it based on how your old cordless drill’s battery would start to lose a little life after just a few rounds, then you might be giving it an unfair shake. The lithium-ion batteries have improved considerably over the years, and now big tools, machines, and appliances are running for as long as an hour on one charge. Plus, most of these blowers come with the chargers and you can buy an extra battery, so you can have one charging while you’re using the initial one. The reasons for buying a cordless blower or thrower are numerous. Let’s take a look at the most obvious reasons, but also perhaps the most compelling. You really can’t beat the convenience of a battery operated blower or thrower. You simply charge the battery or batteries after using it, and it’s ready to go the next time you need to use it. There’s no fuel to get from the gas station, no engine oil to buy, no mixing, and no need to summarize your machine. It’s clean – you won’t get grease all over your hands from maintenance work, and it’s better for the environment. It’s easy to tell when snow has fallen when you wake up each morning. Obviously, there’s snow on the ground, but before you even look out a window, you might hear the roar of a loud snow blower from your neighbor clearing snow before heading to work. Cordless snow-eating machines typically get no louder than a vacuum cleaner. So, you won’t disturb your significant other by clearing your driveway, and neighbors won’t glare at you for waking them up early on a Saturday. You’ve heard of plug and play, and that’s a great description for an electric blower or thrower, but this is even easier. 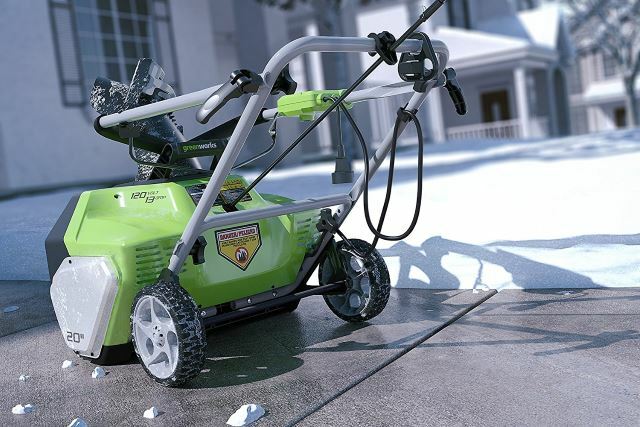 You just pop in a battery, wheel your machine out to your driveway or sidewalks, and start clearing snow. Push it where you need it to go and move all that unwanted snow to your yard, where you can use it later to build a snowman – it doesn’t have to be a snowman, though. Many blowers and throwers are hefty, and part of the reason is that they’re full of heavy parts, such as engines with carburetors, and all sorts of things. These battery operated cordless beauties are much lighter in weight. They’re comparable in weight to electric-powered blowers and throwers. The mass makes a huge difference when you need to move it from your garage to a porch, or even over a fence to your backyard. 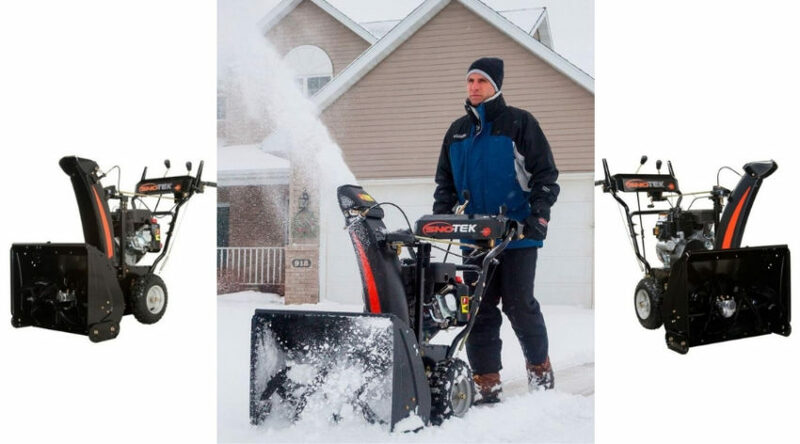 The size of a cordless snow blower or thrower makes a big difference in whether you can buy it. The fuel-powered versions are often bulky and require their own shed for storing or at least a large garage. Even the biggest cordless snow blower included on this list is no taller than 47 inches and 40 inches wide. That’s less than 4 feet tall and only a little more than 3 feet wide. You can easily store that – and it’s easy to maneuver. Those are just a few reasons to buy a cordless snow-muncher, but there are more features you might want to consider before buying. Buying a cordless snow blower or thrower isn’t that much different than buying a corded or gas-powered one. 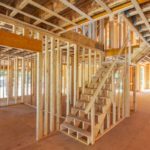 There are plenty of standard features that you should make sure are present, but there are also a few features that are considered extras. Most cordless units offer 40 volts of power from one battery, but some are beasts that use up to 80 volts of power from two batteries. Which you choose depends on how much snow you need to move. 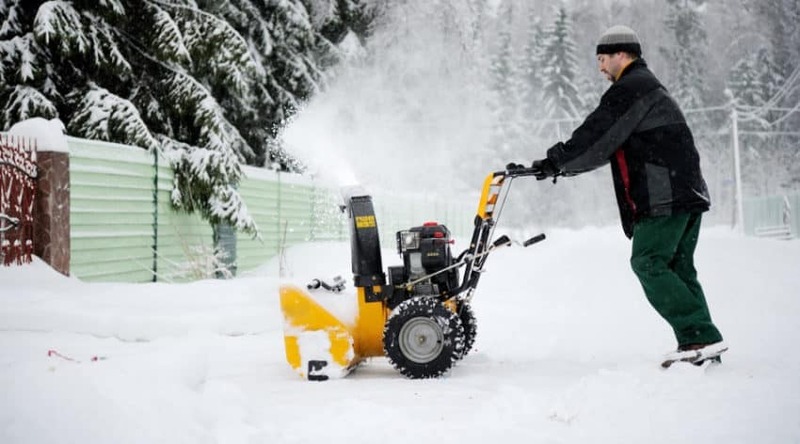 You’ll notice most of these cordless snow blowers and throwers rely on you pushing it – it gets some pull from the motor, but you’re usually providing the pushing power to move it. Some include digital drive power and variable speed to help get it going a little faster and makes it easier for you to clear your driveway and sidewalks. 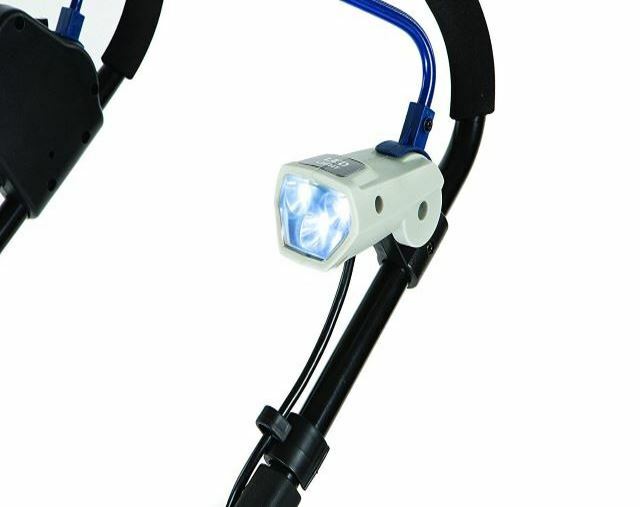 Having a headlight can help make it easier for you to clear snow in the dark, but this is considered an extra. Most chutes require you to turn a crank or move the chute manually to change the direction of the snow that blows out toward your yard. Some include an auto-rotating chute that turns by just pressing a button. This is not a standard feature. To make sure you’re buying the right tool for the job you have, it’s important to get all the information available to you. Read through the best cordless blower reviews to find out what the best fit would be for you. It’s hard to imagine that a cordless snow thrower like the Snow Joe iON18SB single-stage one could clear out big piles of snow, but that’s the reality. Powered only by a single 40-volt lithium ion battery, this lightweight cordless machine is a bit of a beast when it comes to snow. Of course, it’s a small unit, and it’s only single-stage, so it works best on the fluffy stuff. However, it can, if you’re patient with it, handle whatever the city’s plow leaves at the bottom of your driveway. The 18-inch mouth where the auger pulls in snow is wide enough to make sure you won’t have to do too many passes to clear a small to a medium driveway. And although the intake is rated for up to 8 inches of snow, this muncher can handle drifts taller than that, if you go slowly and don’t push it too hard. Wet snow can sometimes get stuck in the auger or impeller, but Snow Joe includes a tool to help you get rid of that clogged snow. While the chute is directed by just the press of a button, which is a huge convenience, it doesn’t always work. If you let your machine warm up a little, it seems to make a difference, though. 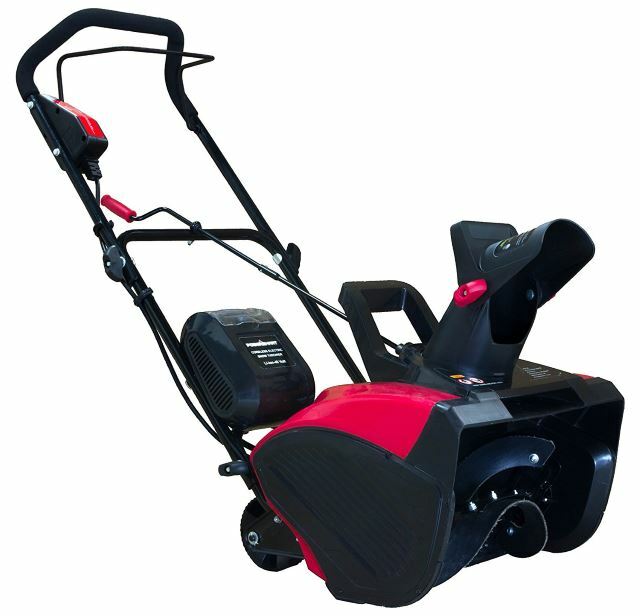 If you need a lightweight snow thrower that can easily handle fluffy snow and can tackle bigger snow jobs with a little patience, this one might be right for you. 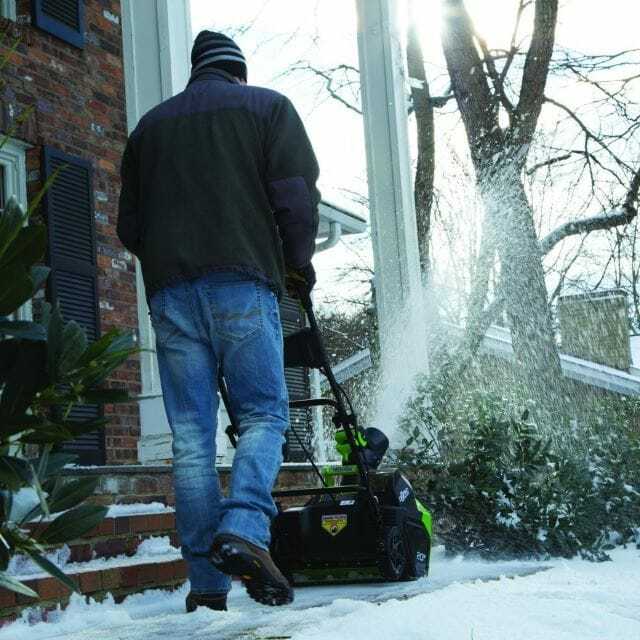 The PowerSmart DB2401 cordless snow blower has about the same size as a small lawn mower, but it’s meant to clear your walkways and driveway of that pesky snow that seems to come every year. Granted, this isn’t the same weight as a typical lawnmower – it’s quite a bit lighter – but that’s what makes it so easy to push. 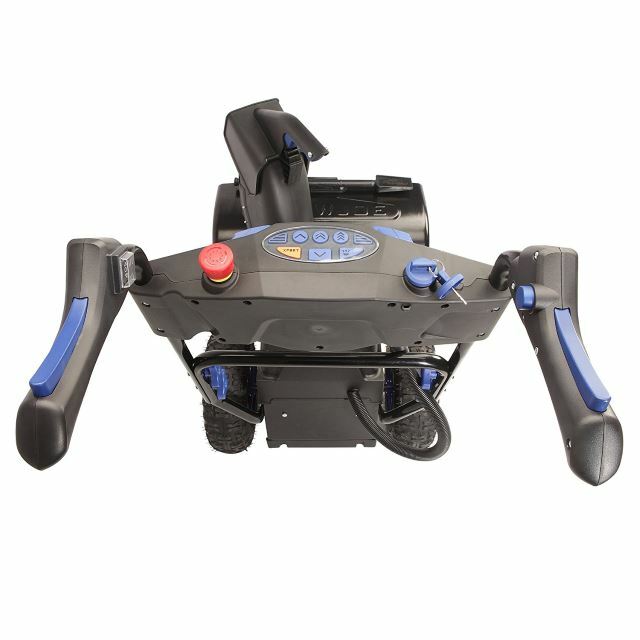 This is a no-frills cordless thrower, so you shouldn’t expect extras, such as a headlight or an auto-rotating chute, but it does work. As long as you point this thing at dry, fluffy snow, it can throw the white stuff up to 30 feet away. Once you task the PowerSmart with clearing wet, heavy snow, it can get bogged down. The chute can clog, and the auger moves slowly. A bit of patience may help, though. This single-stage thrower can clear your driveway all the way down to the pavement, so that’s a big plus. And it’s comfortable to use with its foam-wrapped handlebar. 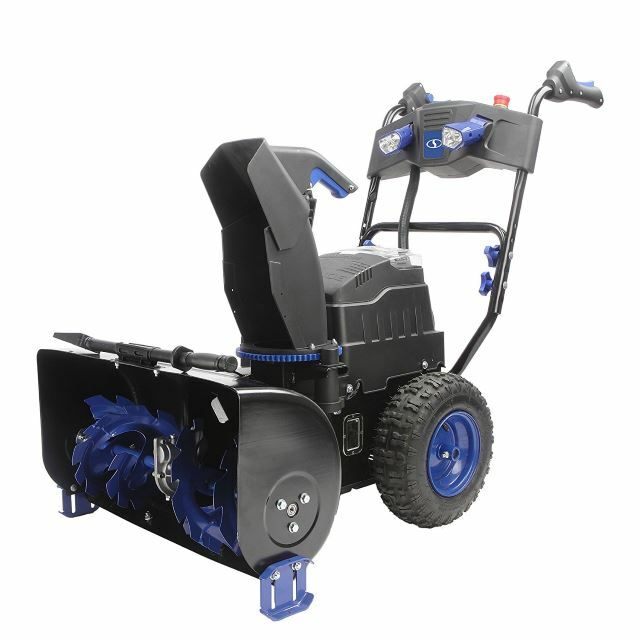 If you live in an arid climate where you don’t get a lot of wet snow, this might be a good snow thrower for you. For a cordless snow thrower, this Snow Joe iON15SB-LT does a good job on inches of snow, but don’t expect it to plow through feet of snow. This single-stage thrower was made for small jobs, so it’s going to do its best work on fluffy snow that’s only a few inches high. That doesn’t mean, however, it can’t handle the big stuff. You may have to knock down the big drifts of snow or what the plow left you, but if you go slowly, this little guy can handle it. The battery is a bit underpowered, compared to some other cordless units, but if you buy a second battery, you can simply pop one out after the 25 to 30 minutes it lasts and pops a new one in to continue clearing. It’s a quiet and lightweight machine, which means it shouldn’t disturb your neighbors when you use it, and you can easily lug it up and down stairs or in and out of a car. The chute can sometimes go a little awry, which could be a problem, though. If you need a cordless blower that can clear a small driveway and a couple of walkways in under 30 minutes, this might be the one for you. Plowing capacity: 1,000 lbs. per min. 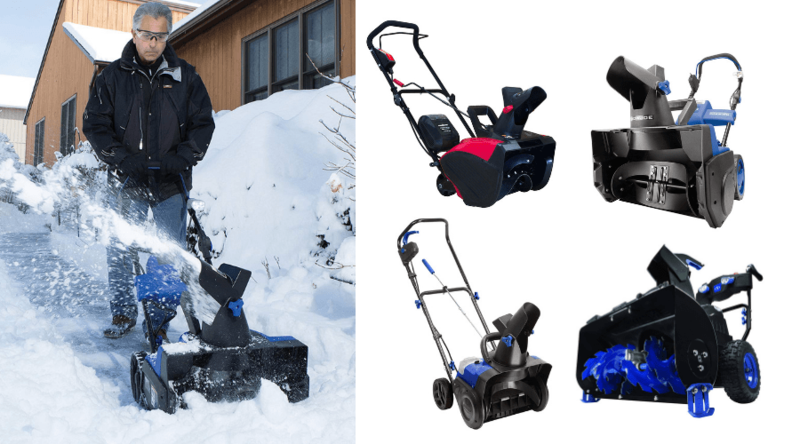 Not everyone needs a cordless beast like the Snow Joe iON8024-XR, but those who do will be happy to know that a two-stage battery-powered snow blower exists. There are many reasons to plop down a big wad of cash for this bad boy, but let’s go over the most obvious. This Snow Joe two-stage unit is a beast when it comes to eating snow, but it’ll only do so for about 30 minutes before the batteries need recharging. That’s right, plural: batteries. This operates on two 40-volt batteries to equal 80 volts of power. Although you’re doubling the power, it’s a big machine that needs more power to give you the self-propulsion and digital drive. You get variable speeds with this blower – something that is not typically included on cordless units. 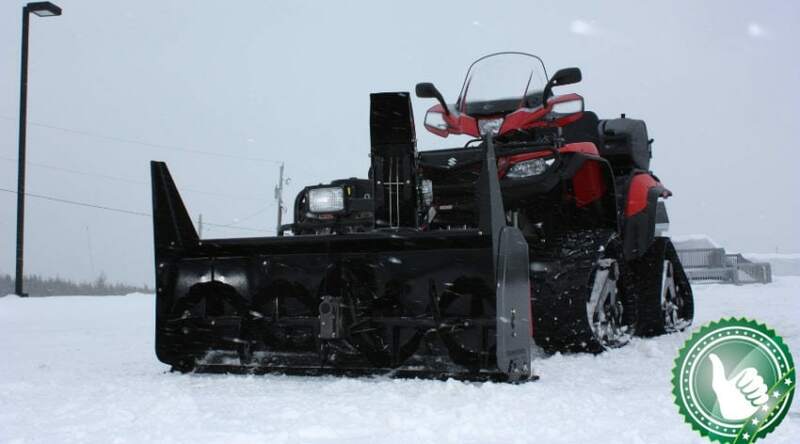 The height of the mouth of this machine is a little more than a foot, which means it can tackle big mounds and drifts of snow up to 2 feet in width. You should be able to clear a large or long driveway, sidewalks, and walkways before running out of charge. The chute has an auto-rotation feature, so you can turn it and point the snow where you want it by simply pressing a button. A digital display shows you what speed you’re in and how much battery power you have left. It’s as quiet as the other cordless machines, despite being a bigger unit. 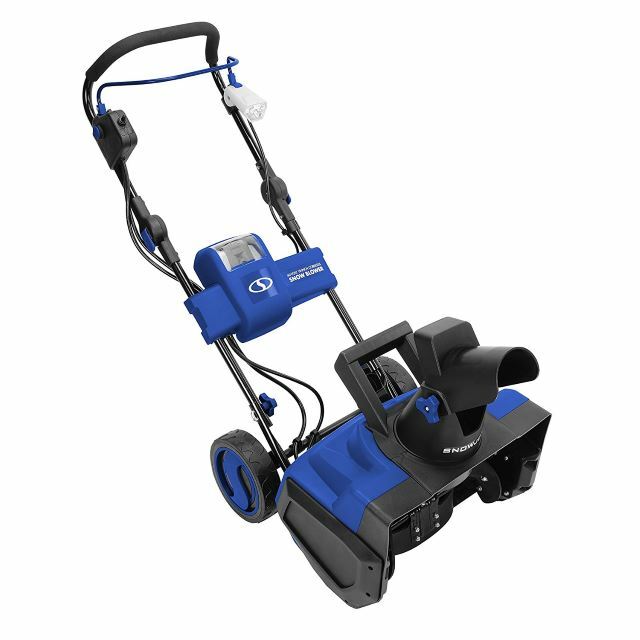 You also get a headlight, and it has metal snowshoes, which means you can go over gravelly paths and uneven pavement without scraping anything, making this one of the best rechargeable snow blowers on the market. If you want to replace a gas unit with a comparably powerful machine, be prepared to spend a bit more for this, but it could be perfect for you. A snow thrower that can handle big piles of fluffy snow without trouble is what you want, and Greenworks answered by offering its 20-inch cordless thrower. 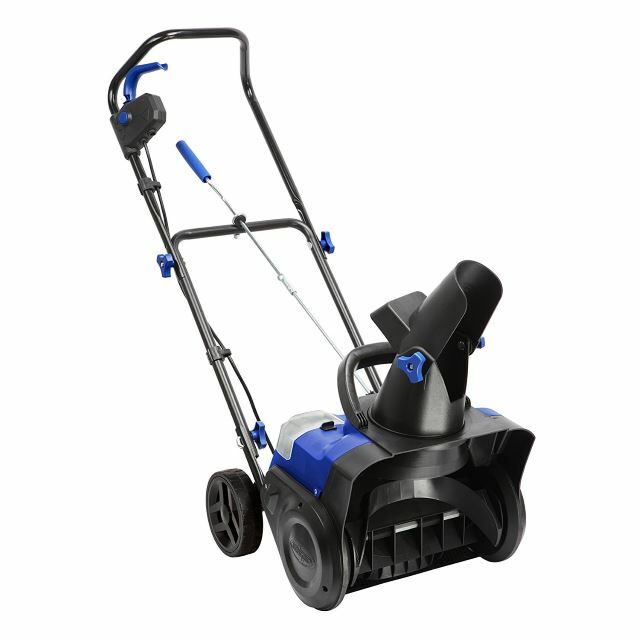 It seems to do a great job on a couple inches of snow that’s accumulated on flat surfaces, but because this thrower clears down to the pavement, it won’t work well on uneven or gravelly walkways or driveways. This single-stage unit handles dry snow well, but it has a harder time with wet snow. The only real extra it includes is a headlight, but for the most part, it sticks to the standard features. The 40-volt battery could last you up to 45 minutes of continuous use, but that’s if you get a good thrower. It seems that Greenworks has had issues with either defective batteries or defective units often. 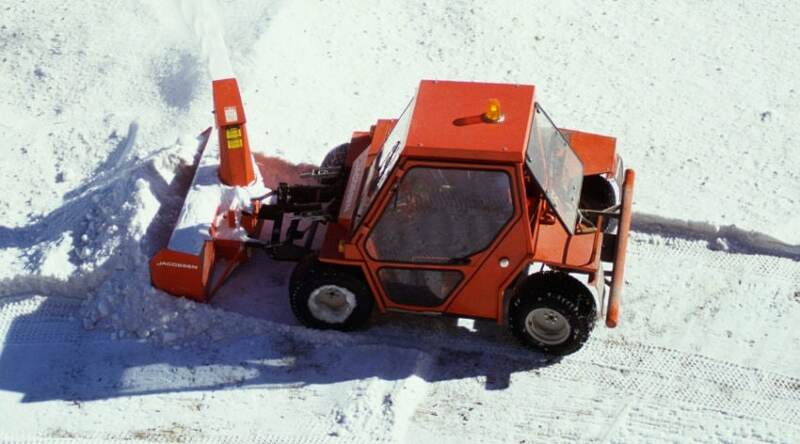 The machine works well until it hits snow for some people, and then it shuts off. The good news is that the snow-muncher comes with a four-year warranty (two years for the battery and charger), so the manufacturer should be able to work out the issue if you have it. When you need a small, easy-to-maneuver thrower without cords or gas, this little guy could be just the one you’ve been looking for. Many of the cordless throwers reviewed here have similar specifications with a few little differences here and there. Some have headlights, while others offer auto-rotating chutes. And then there’s the beast that’s a two-stage cordless snow-loving beast. All the units here are considered the best cordless blowers on the market. One, however, seems suitable for almost any homeowner that deals with moderate snow each season and an average-sized driveway and sidewalks to clear. 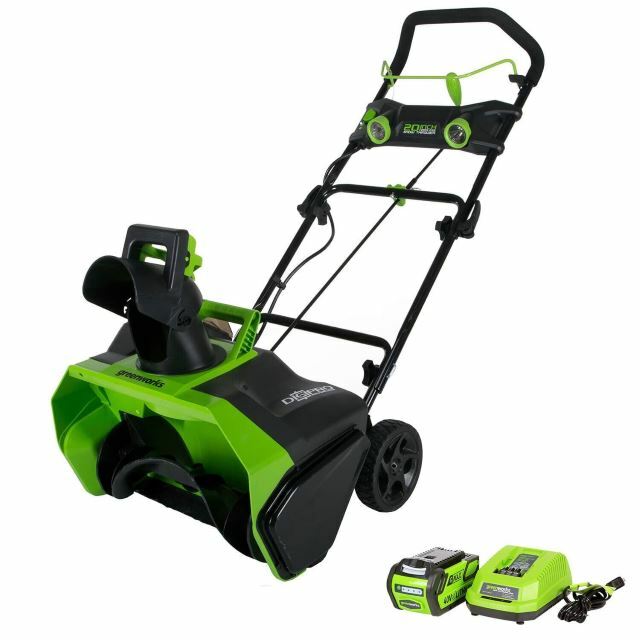 That has to be the Snow Joe iON18SB Ion Cordless Single Stage Brushless Snow Blower. The Snow Joe iON18SB may only be a single-stage thrower, but it can tackle bigger jobs than it’s meant to do and does them well. If you’re patient with it, and you don’t push it too hard, it can take out tall drifts of snow with no problem. Do yourself a favor if you do buy one of these cordless units: Invest in a second set of batteries. You should be able to clear your property on one fully charged battery, but you never know what Mother Nature is going to drop on you at the last minute. 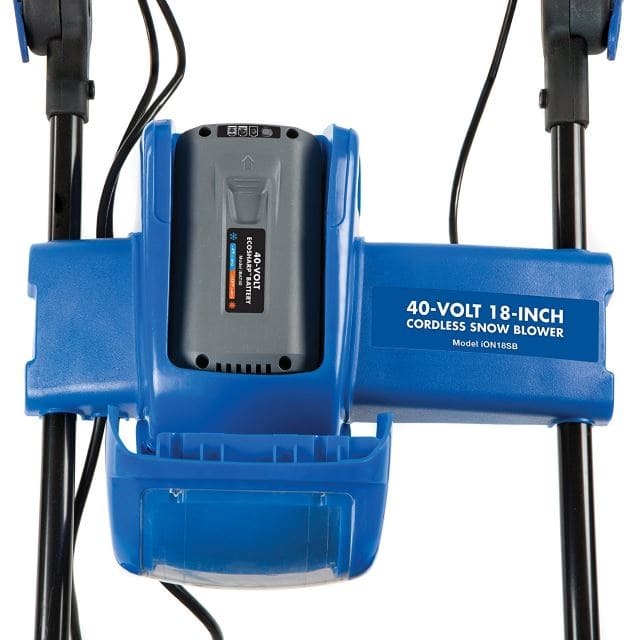 For anyone who deals with snow, this cordless unit could be a great buy, and keep you from having to purchase a regular snow blower.